This year’s black Friday sales have seen a whopping £5,370 worth of food being donated to the Newcastle West End Foodbank as a result of our Food Bank Friday (Alternative to Black Friday) offer. For the past few years now we’ve been running a feel good alternative to the regular black Friday sales you’ll see every year. As well as offering 20% off almost everything in store, when you spent over £30 we donated a much needed item to the local foodbank. The West End Foodbank is the largest in the UK, offering its services to over 1,000 people per week. This can equate to distributing up to £500,000 worth of goods every year. With the use of foodbanks still increasing according to The Trussel Trust, and this close to Christmas, it’s more important than ever to give what you can. With your help we’ve been able to donate a total of 3,289 items this year, an increase on the 2203 that were donated last year. Once we received the final figures, we placed a special order through one of our biggest suppliers – Suma Wholefoods – choosing items based on what the foodbank has told us they need. 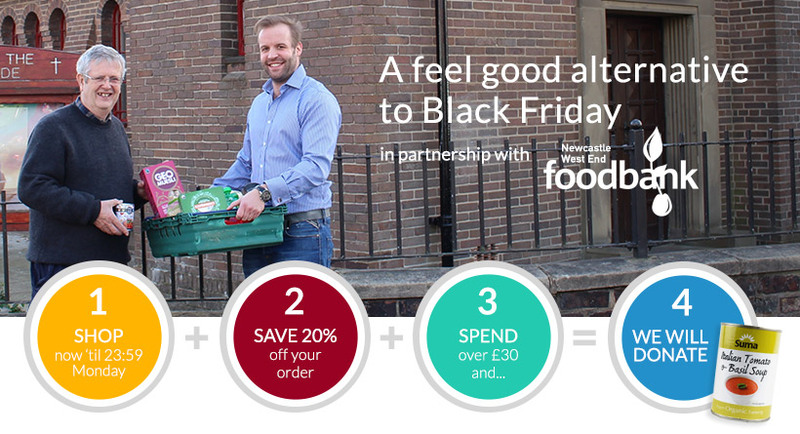 You can find out more about our Black Friday Foodbank offer here. We want to take this time to give a huge thank you to everyone who helped us give this amazing donation to the West End Foodbank, and to those who have donated during the year. Through our checkout donations, you’ve raised over £40,000 for a range of causes, including Medecins Sans Frontières, Amnesty International, RSPCA, DEC, Whale & Dolphin Conservation and Trees For Life – you can also choose to donate to the West End Foodbank throughout the year using the checkout donations. Here’s hoping we have another successful year of charitable donations, and let’s see if we can give more than ever to the West End Foodbank. Happy Christmas from all the team at Ethical Superstore!